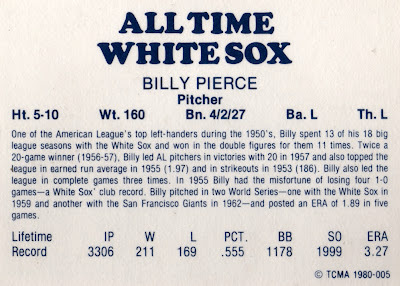 It's a testament to Billy Pierce's success and popularity in Chicago that his Wikipedia entry includes (as of writing) 104 footnotes (a.k.a., external references), an impressive amount of research. By comparison, long-time rival (and HOFer) Whitey Ford's entry cites just 9. White Sox fans clearly want Billy's story to be told and remembered. As with other TCMA All-Time sets, Chicago fields a manager, 3 pitchers, and 8 position players. It's odd to call a HOFer underrated, but manager Al Lopez deserves recognition for guiding Cleveland and Chicago to winning records all 17 years he worked the dugout. Even his "worst" full-season record was a more-than-respectable 85-77! Five-foot-ten and 160 doesn't sound like a strikeout pitcher, but Tim Lincecum's only ten pounds heavier and does OK for himself. Value: CheckOutMyCards.com lists most of the set for less than $2 each. Fakes / reprints: Haven't seen any in the market and the risk's low someone would fake them. 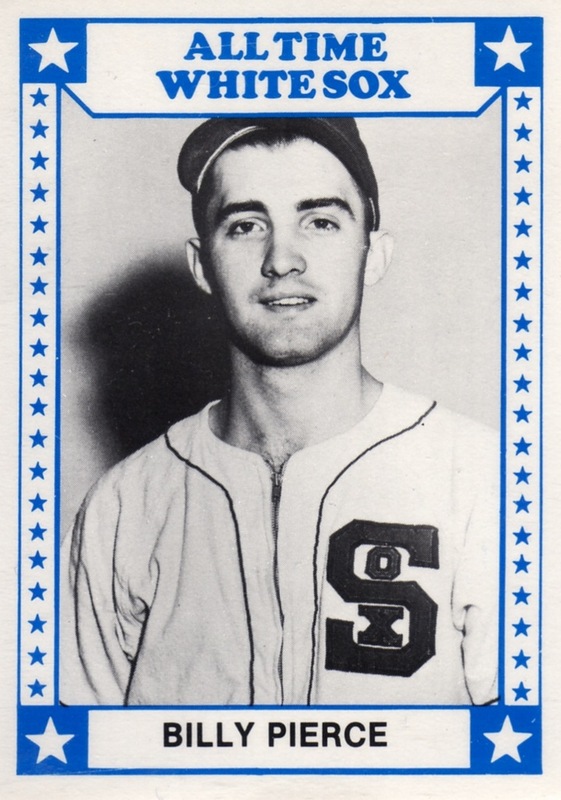 Interesting that none of the "Black Sox" of 1919 were given a card in the set. TCMA did a separate release for the 1919 White Sox. Billy is still very much involved with the White Sox organization, which makes him even more beloved. For a long time, anyone attached to the '59 team could do no wrong.